(internet view to detail unavailable) Postal Telegraph [illegible] [graphic]Telegrams Cablegrams Radiograms All America Cables Commercial Cables Received At 133 A Main Street Hempstead, New York Tel. 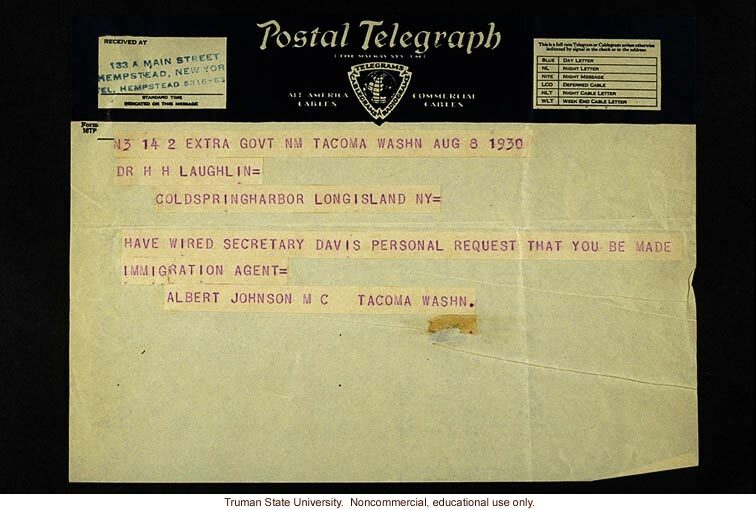 Hempstead 5316-[illegible] [right box mostly illegible] Form Xtp [message]N3 14 2 Extra Govt NM Tacoma Washn Aug 8 1930 DR. H.H. LAUGHLIN= COLDSPRINGHARBOR LONGISLAND NY= HAVE WIRED SECRETARY DAVIS PERSONAL REQUEST THAT YOU BE MADE IMMIGRATION AGENT = ALBERT JOHNSON M C TACOMA WASHN.